CARACAS, Feb. 3 (Xinhua) -- Venezuela's President Nicolas Maduro on Sunday urged the National Bolivarian Armed Forces (FANB) to remain united amid mounting pressure from the opposition. 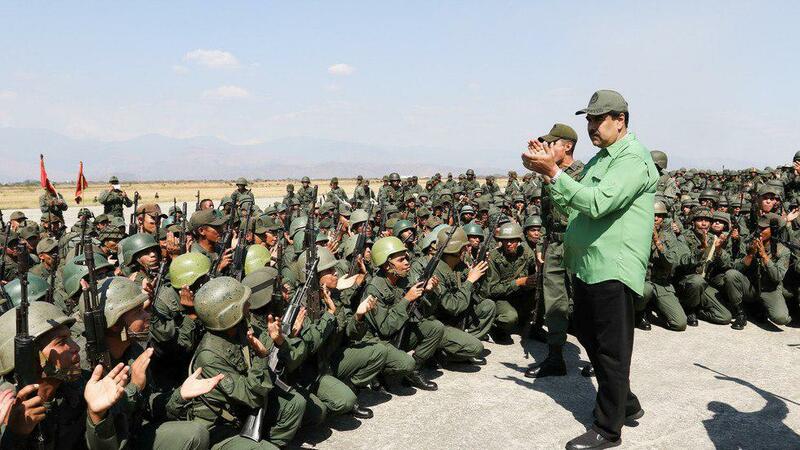 "You soldiers of the nation are the maximum guarantee of unity, integrity and respect for Venezuelan sovereignty. We are at a time of defending our independence," said Maduro at the Turiamo naval base in Aragua state. Overseeing naval preparations before the nationwide military exercises, Maduro called on the nation's armed forces to "rise to the historic occasion that we live in." National conservative factions, aided by international right-wing governments, especially the United States, are conspiring to divide the nation, Maduro said. Saturday saw tens of thousands of Venezuelans fill the streets as both Venezuela's ruling socialist party and opposition coalition organized competing rallies in a show of strength. "Is Venezuela going to become another star on the gringo flag or is Venezuela going to continue to fly its own flag?" Maduro asked the assembled troops, referring to a photo of opposition supporters waving a U.S. flag. "Neither intervention nor civil war, in Venezuela there is going to be peace," said Maduro. Washington has been aggressively backing the opposition in Venezuela in a bid to oust Maduro from power, as U.S. President Donald Trump is endorsing opposition leader and self-proclaimed "interim president" Juan Guaido and threatening military action. The military drills in Venezuela are planned from Feb. 10 to 15.